The Leakey family has been the most famous and one of the world's most productive groups of paleoanthropologists, scientists who study human origins. Over the span of more than seventy years, they have made major discoveries proving that humans originated in Africa, and that human ancestors were much older than previously believed. Louis Leakey (1903–1972) was born and raised in Kenya, Africa, as the son of missionaries. He began research there in 1924, convinced that humans originated in Africa rather than Asia, as many scholars thought at the time. In 1931, he began work at Olduvai Gorge in Tanzania, which became the site of many of the most important discoveries of human fossils. 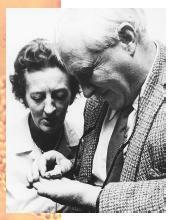 In 1936, Leakey married Mary Nicol (1913–1996), who joined him in his work and eventually became the principal scientist after Louis Leakey began to devote more time to fundraising and lecturing to support their research. They were later joined by their sons Jonathan and Richard, Richard's wife Maeve, and Richard and Maeve's daughter Louise. The Leakeys continue to research human origins throughout East Africa. For many years, they have been assisted by Kamoya Kimeu, a Tanzanian who has actually made many of the greatest fossil discoveries under the direction of the Leakeys. Among the major discoveries by the Leakeys are the prehuman Zinjanthropus (now called Australopithecus boisei ) and Homo habilis, or "handy man," which, at approximately two million years old, is the oldest known primate with human characteristics. In addition to their paleoanthropological work, the Leakeys have been central figures in promotion of conservation of Africa's biodiversity. Louis Leakey was also the mentor for three great field primatologists: Jane Goodall, who continues to study chimpanzees in Africa; Dian Fossey, who died studying gorillas; and Birute Galdikas, who studies orangutans in Borneo. Morell, Virginia. Ancestral Passions: The Leakey Family and the Quest for Humankind's Beginnings. New York: Simon & Schuster, 1995. American zoologist and authority on the behavior of mountain gorillas. Fossey established the Karisoke Research Center in the mountains of Rwanda. The wild gorillas accepted her presence, and she was able to record every detail of their behavior. In 1985, however, her efforts to protect the gorillas from poachers resulted in her own murder.